The 23-year-old attacker is committing to the Premier League champions until 2023. Raheem Sterling in action for Man City earlier this month. MANCHESTER CITY HAVE confirmed that Raheem Sterling has signed a three-year contract extension which will keep him with the Premier League champions until 2023. The new deal is reported to be worth up to £300,000 [€343,000] a week, according to BBC Sport. Sterling played a vital part last in last season’s Premier League title success, scoring 18 goals and setting up another 11. He has started the new campaign impressively as well, playing a role in 11 goals in just nine league outings as City sit top of the table ahead of Sunday’s Manchester derby. Sterling’s previous deal was set to expire at the end of next season and talks over a renewal were reported to have started many months ago. The 23-year-old attacker has come on leaps and bounds at City since joining from Liverpool in 2015, a deal which may eventually cost the club nearly £50million. Pep Guardiola’s introduction as coach in 2016 seems to have had a particularly significant impact on his development, after being criticised for a lack of consistency in the final third earlier in his career. “I’m really delighted to sign,” said the England international. “My development here has been incredible. “Every season you come in you want to do better than your previous season. You want to try and develop and get better and also with the facilities you’ve got here there’s no reason not to. “This is a significant moment for the club. 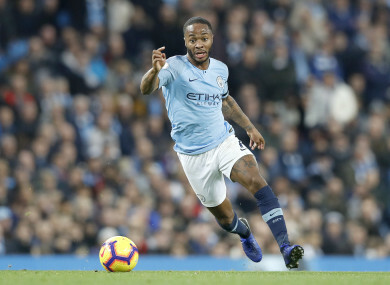 Raheem has improved dramatically in the past two seasons and is now one of the Premier League’s best attacking players. His statistics tell their own story. Email “Staying put! Sterling signs Manchester City contract extension worth up to £300,000 a week”. Feedback on “Staying put! Sterling signs Manchester City contract extension worth up to £300,000 a week”.